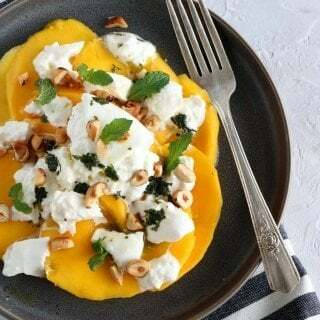 Summer salad with fresh mango, burrata cheese, toasted hazelnuts and a subtle mint pesto. Quick, easy, and full of exotic flavors. 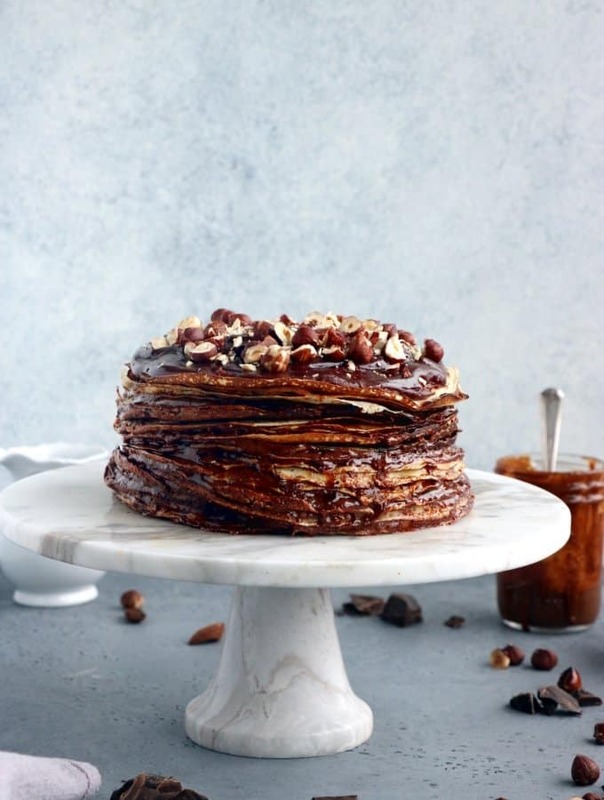 Today’s recipe is extremely simple, so simple indeed that you almost don’t need any recipe, if at least to bring you some inspiration the first time you prepare it. And because you will probably remember the entire recipe by heart at once, I bet you will end up doing it again and again many times in your life. It’s fresh, original, full of exotic flavors and so delicious. The perfect summer recipe and starter to a fancy meal with friends. 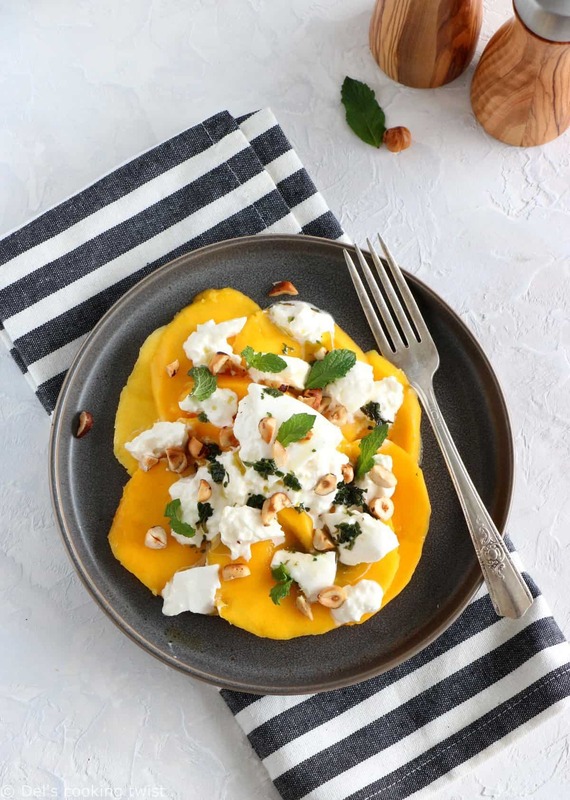 At first, it looks like a simple mango salad, and it is. I use here fresh ripe mangoes that I slice in thin layers lengthwise, like you would do for a mango carpaccio somehow. Because you want very thin layers, it is important to use ripe mangoes that are still firm enough so they can keep their shape while you slice them. It’s not always easy to choose fresh mangoes but when you feel that they are soft when you grab them, they should be just fine. I have always loved mangoes very much. 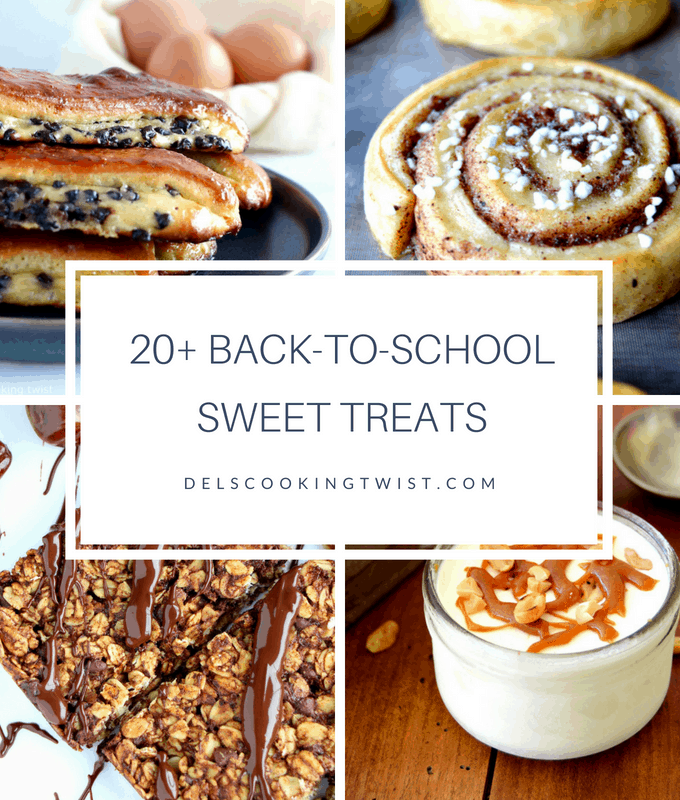 They are so sweet, extremely soft so they melt in your mouth, and they also go very well in both sweet and savory recipes. This time, I paired mango with burrata cheese. Before I go further, have you ever heard of burrata? I am completely obsessed with this cheese, especially in summer, because of its irresistible freshness and texture and it’s my to-go cheese in so many salads lately. Burrata is indeed a fresh Italian Buffalo milk cheese made from mozzarella and cream. What makes its texture so characteristic is the contrast between an outer shell made of solid mozzarella, while the inside contains stracciatella and cream, giving it an unusual, soft texture. 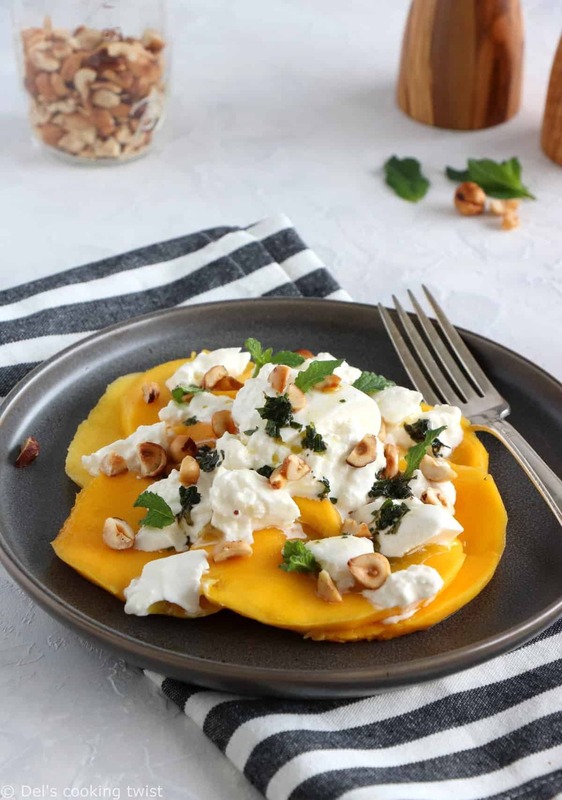 In this recipe, I simply sprinkle burrata all over the mango salad to play with this contrast of texture between the solid shell and creamy inside. Now if you do not have any burrata at home, you can totally replace it with other cheese. Mozzarella will be the closest one, except that you will not have the creamy part. If you are looking for this specific texture more than the solid one, go for ricotta cheese instead, and simply sprinkle it all over the salad. Both mozzarella and ricotta cheese have a relatively sweet neutral taste that make them easy to adapt to this kind of recipes. Now if you want to add a little personal twist, I would recommend soft goat cheese. 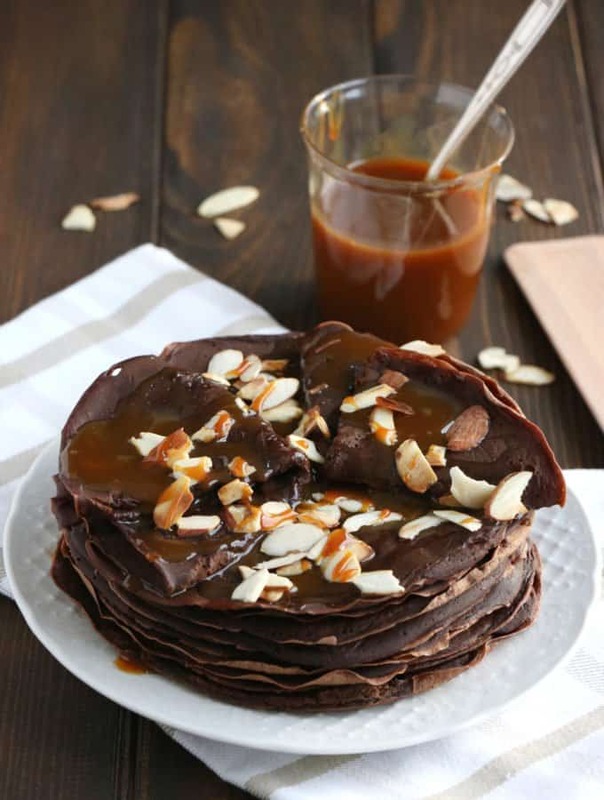 Be aware that the recipe will taste totally different but if you like sweet and savory dishes, you will be amazed by this combo. 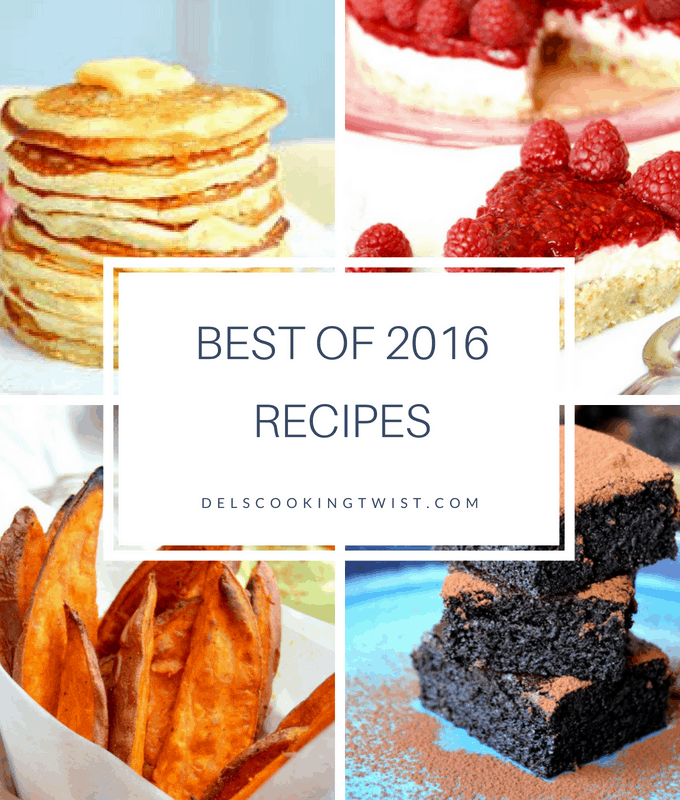 My recommendation: why don’t you try each version every time you make the recipe again? The dressing to this amazing salad is a very basic mint pesto, made of fresh mint leaves and olive oil only. Unlike a classic pesto that uses parmesan cheese and nuts, this one is plain. 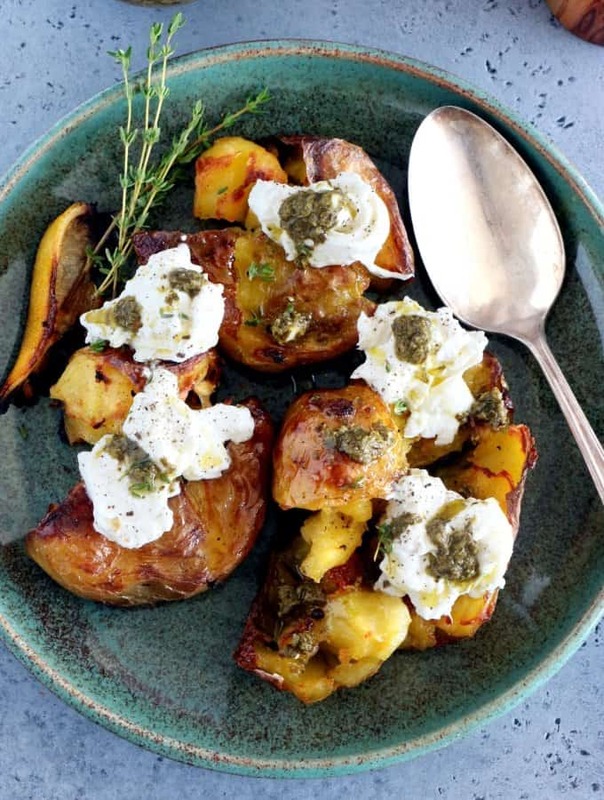 The idea is to enhance the mint which pairs beautifully with the fresh mango and burrata. Sometimes you don’t have to go too crazy; just keep simple flavors and it should do the trick. I pour the mint pesto over the salad, but note that you do not need too much, just drizzle a little bit there and there. I then sprinkle some toasted hazelnuts all over the salad, bringing this crunchiness that was missing. I toasted mine in butter in a frying pan until they turned golden brown, and then rubbed them in a towel to remove the loose skins. Chop the nuts or use them plain if you prefer, then sprinkle all over the salad. You could also imagine the use of other nuts, such as almonds or cashew nuts that would work very well with mango, and maybe also walnuts if you happen to have any at hand. The final touch consists in grinding fresh pepper and fresh chili pepper over the mango salad. It might looks like it’s just a detail but it can totally transform the recipe if you use good quality ingredients, such as Timut pepper from Nepal, or grind the whole chili directly with the use of a chili pepper mill. I use Peugeot Saveurs products for both Timut pepper and chili pepper mill and I am completely sold. It’s high quality products, both for spices and mills, and I have never been disappointed by any of them. I have heard they are starting an online shop pretty soon, make sure you check it out. 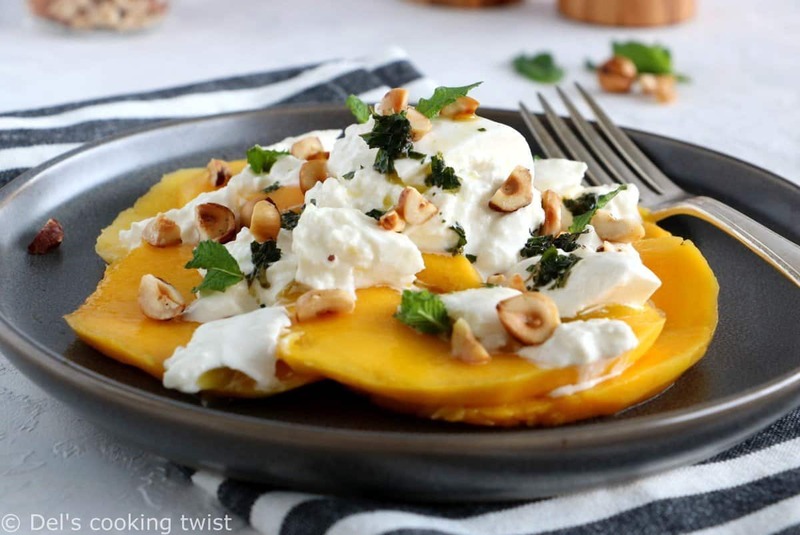 And for the moment, let’s enjoy this wonderful mango burrata salad! 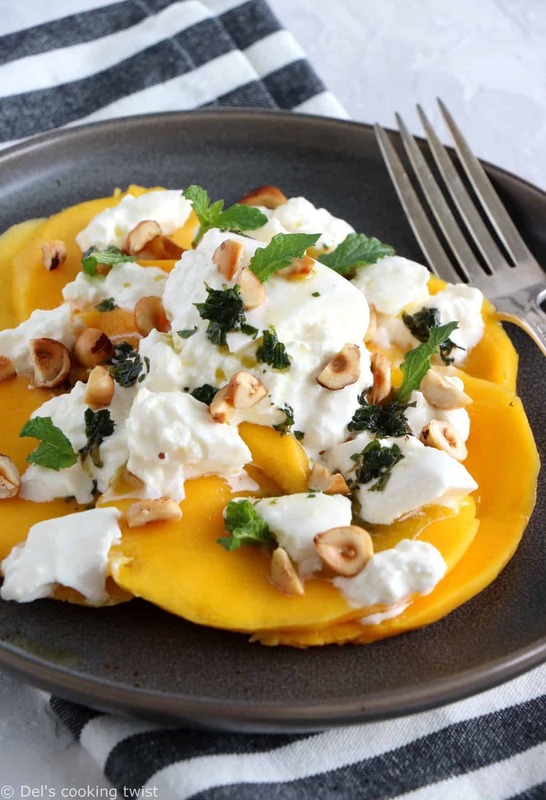 In a serving plate, place slices of mangoes and sprinkle burrata cheese all over. Season with freshly ground pepper and chili pepper (optional). In a frying pan, toast the whole hazelnuts in butter until golden-brown, stirring constantly. Remove from the pan and transfer the hazelnuts onto a clean towel. Rub them vigorously inside the towel to remove any loose skins. Chop hazelnuts roughly, and sprinkle over the salad. To prepare the mint pesto, mix mint leaves and olive oil in a food processor until finely ground. 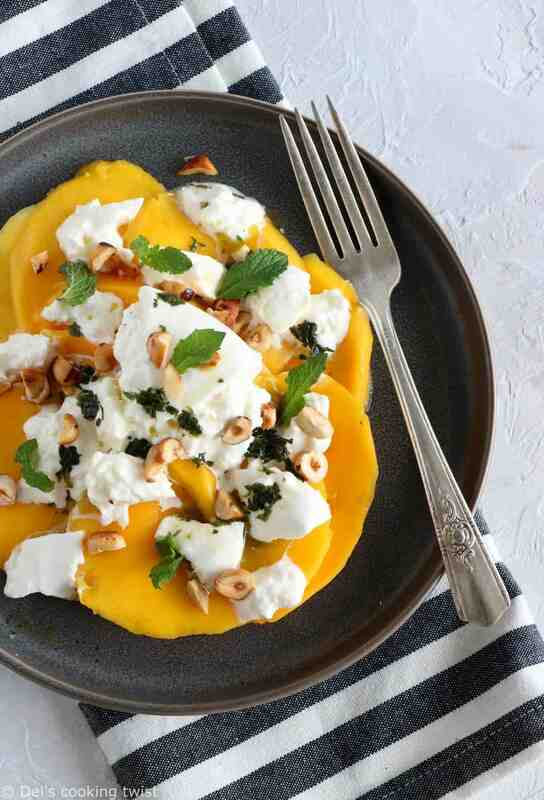 Pour the mint pesto over the mango-burrata salad and serve immediately. * I used Timut pepper, from Southern Nepal. ** For best results in terms of flavor and heat, I recommend the use of a manual chili pepper mill to grind dried chili peppers. C’est une bien jolie salade que tu nous proposes !